New features available in Crelate’s web-based recruiting software solution. 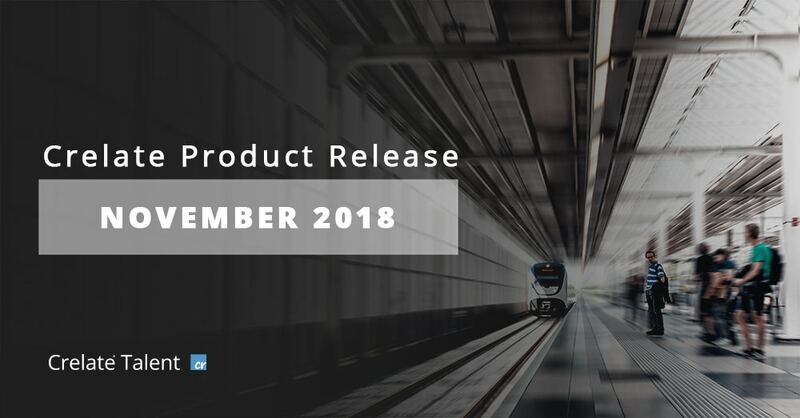 Find product release details in the bulleted list below. The best times at Crelate happen in the weeks leading up to a product release. It’s because our product, testing, marketing, sales and support teams all come together on a fast-moving train, and everyone has to get on the same page to keep moving in the right direction. Everyone has to be on point otherwise we risk derailing the train and when everyone is on point, it’s an inspiring feat to watch. When I get a minute to pause and think about the features we’re releasing, they generally fall under two categories: new features or expansion features. New features enable new possibilities for business processes or ways of interacting with Crelate that didn’t exist before, and expansion features take an existing process and further tweak and refine it. Expansion features are my favorite part about working at Crelate because we get to tell our existing customers that their feedback has been actioned. Customer feedback is ingrained in everything we do, and it’s also why we maintain a very high trust and satisfaction rating from our customers. I love the reactions I get from customers when I tell them the feature they were requesting is now live. It will never get old. Having customers who believe in us is critical and has always been an important way in which we do business at Crelate. Many of us previously worked for large consulting firms. As a consultant, I once got a call from a customer asking if I’d meet with him to evaluate a company selling a time-and-expenses software solution. The interesting part of this story is that we didn’t sell or implement this type of solution at the firm, but this customer trusted us and valued our opinion. We had become such an integral part to the success of his company that we became a trusted advisor. I brought this consultative advisory approach to my career at Crelate, because this company understands that a customer’s trust is the most important element of a successful business model. When I get feedback about how to further expand or improve an existing feature, I’m always elated to hear how much Crelate has become a critical business system for our customers. I’ll have customers tell me that they rely on Crelate for planning and executing on their day-to-day actions, and it would be great if we could tweak “this one thing” to make their life easier. It’s a sign to me that we as a product and a company have become a trusted part of their daily work, and I enjoy improving that at every chance we get. Even though it’s only been a month since our last product release, there were some important refinements that I wanted to share that will be available in your Crelate account on Monday, November 12th. In addition to our normal performance tweaks, we’re expanding on features in a couple of important areas: Reporting and User Experience. Open / Completed Activity Reports: Many users rely on our activity reports for informing them on critical business performance. Now you’ll be able to segment that even further by reporting on activities that are Completed or Not Completed. System Views Privileges: Crelate ships with a series of system views designed to allow users to get the information they need from the moment they log in. Admins can tweak privileges to some of the views with more granular control over what a user sees when viewing rows of records to better align that experience with their individual business processes. Like I said already, release time is really the best time at Crelate, and I believe we have one of the most frequent release cadences in the recruiting software industry. We want to deliver value to our customers as quickly as we can. It’s our chance to fulfill the trust that our customer have in us, and to continue to grow our relationship with them.